Configured without stackable buses. Return to our Ethernet Switch selection guide to view other switch configurations. 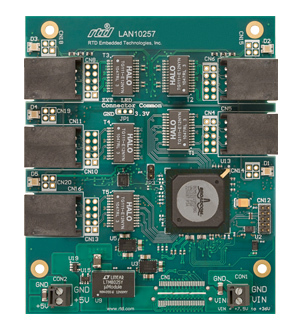 The LAN10257 is a 5-port 10/100/1000 standalone Ethernet switch. This module provides five RJ45 ports with auto-configuration so any of the ports can be upstream or downstream. Connections to an optional host are made via cabling.